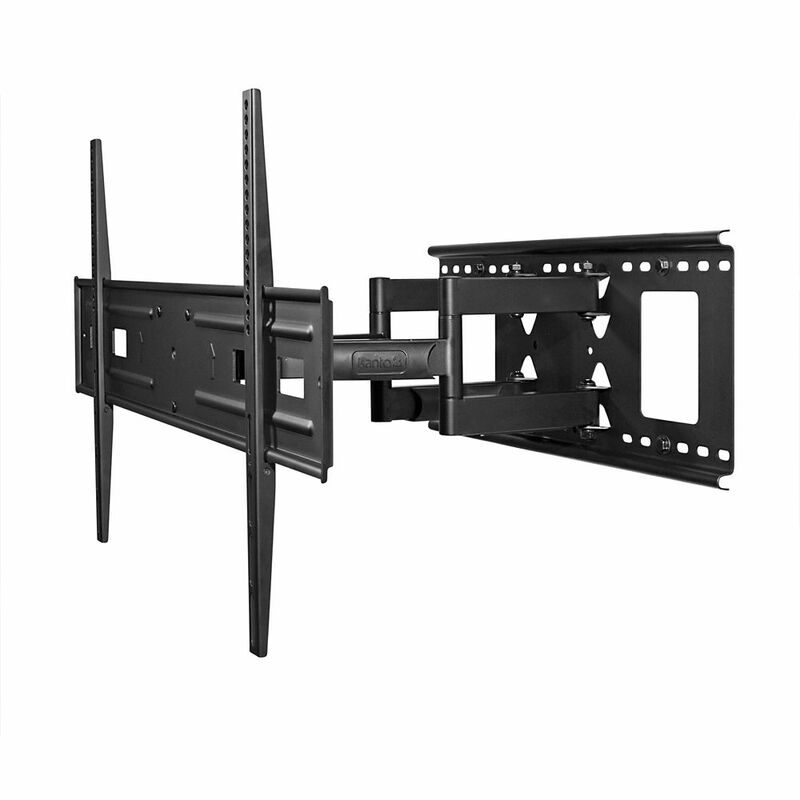 The FMX2 is an articulating TV wall mount that offers an impressive range of motion. Built for TVs up to 80 in size and weighing up to 130 pounds, this full motion TV mount does it all extends 20 from the wall, swivels 800 left or right, and tilts 200. Perfect for hanging TVs with even the widest VESA patterns, you can shift your TV on the plate to optimize your viewing position. With sleek cable management, solid steel construction, and an easy installation process, you've got everything you need to display your TV safely and securely. A great fit for both home and commercial installations, the FMC4 is a full motion TV mount that offers incredible versatility for your wall-mounting needs. The adjustable pivot point lets you center your TV perfectly, or move it to either extreme if you need to wrap it around a corner or accommodate off-center studs. Heavy duty solid steel construction means this mount supports up to 100 pounds plenty of strength for today's bigger TVs. With almost limitless swivel capability and 26" of extension, this unique TV mount can meet almost any mounting challenge. The M300 is a one-stud solution for those wanting a wide range of viewing angles without taking up too much wall space. Designed for medium-sized TVs, this versatile mount features a heavy-duty steel arm that supports up to 80 pounds, and allows for easy tilt, pan and swivel adjustments. With a clean powder-coated finish and integrated cable management, the M300 is a sleek answer to your TV mounting needs. Available in black or white. FMX2 Full Motion Mount for 37-inch to 80-inch TVs The FMX2 is an articulating TV wall mount that offers an impressive range of motion. Built for TVs up to 80 in size and weighing up to 130 pounds, this full motion TV mount does it all extends 20 from the wall, swivels 800 left or right, and tilts 200. Perfect for hanging TVs with even the widest VESA patterns, you can shift your TV on the plate to optimize your viewing position. With sleek cable management, solid steel construction, and an easy installation process, you've got everything you need to display your TV safely and securely. FMX2 Full Motion Mount for 37-inch to 80-inch TVs is rated 5.0 out of 5 by 1.